Jan 16, 2015, at the Arena Cinema marked the opening premiere of “Pretty Rosebud (2014).” The night opener started off with a high energy red carpet showcase, filled with notorieties from all walks of the entertainment industry. The red carpet was filled with a sea of photographer’s and entertainment news personals capturing all aspects of “Pretty Rosebud (2014)” premiere. With smiles, hugs, greetings from event goers, “Pretty Rosebud (2014)” made a true statement of love and support for film Director/Producer/Actor: Oscar Torre and Writer/Producer/Actress: Chuti Tiu. Q&A was held after the movie screening to talk with Director/Producer/Actor: Oscar Torre and Writer/Producer/Actress: Chuti Tiu about their film. A standing ovation was felt throughout the room, which left a heartwarming smile from Oscar Torre and Chuti Tiu. After Q&A, an after-party took place at Sadie’s Kitchen and Lounge, which guest got the chance to mingle and have a great time. Certainly, this high energy event made a true statement and reminder that every hard working filmmaker can bring out love and support for an unbelievable night. 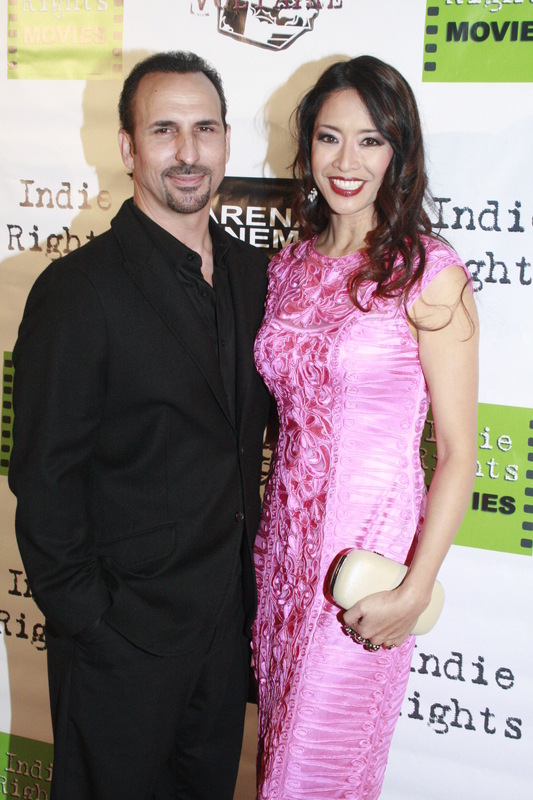 Director/Producer/Actor: Oscar Torre and Writer/Producer/Actress: Chuti Tiu are not only responsible for making “Pretty Rosebud (2014),” but are a real life husband and wife duo. Torre and Tiu certainly delivered a brilliant concept, with creative vision. Chuti Tiu was recently recognized for her achievements on “Pretty Rosebud (2014)” and received several awards from Action on Film International Film Festival, USA. Certainly, a statement in itself! “Pretty Rosebud (2014)” takes you on a journey of Cecilia ‘Cissy’ Santos (Chuti Tiu) a career woman, battling a marriage on the verge of divorce, juggling family traditions through her parents eyes, and struggling through guilt from elements at hand from adultery. Phil Santos (Kipp Shiotani) is Cecilia’s husband, whom has been dealing with the loss of work, lack of inspirational drive, detachment issues from Cecelia, and compulsive drinking. The relationship between Phil and Cecilia’s has lost it’s luster, passion, and motivation to stay connected. This seems to be a forever evolving crisis that eventually show’s itself at the end. Alejandro (Oscar Torre) is Cecelia’s sparing couch and lover on the side. The relationship dynamic seems to be an open door for Cecilia, but it is not her true focus. Cecilia finds herself on this sexual conquest with several other men to satisfy her pain, but is consumed in guilt by what she has done. This element has forced Cecilia to face reality head on, which has exposed her to what is truly important in her life. Although, the brief interludes had temporary satisfaction for Cecilia, resolve was needed to change the course of her life structure all around. Only life purpose, choice, and possibility of letting go were the key fix at this point. Cecilia’s parents Dr. Crescencio Lam (Dana Lee) and Letty Lam (Bel Hernandez) worked very hard to illustrate the love and values instilled in their children, but this seems to not hold steady. Coming from a Filipino family of strict morals and religious beliefs, adultery or marriage outside of raise was not accepting within the Lam family. Many traditional values seem to take it’s tole on Cecilia, which comes face-to-face down the line. Although, the elements that surrounded Cecilia and Phil seemed to be a very large concern to Mr. and Mrs. Lam they learned to grow practical of the dynamic’s at hand. “Pretty Rosebud (2014)” delivers a true core of self worth, and making peace within one’s self on the road of life. Certainly, a well written and directed film body structure, which leaves viewers truly engaged throughout. “Pretty Rosebud (2014)” gets two thumbs up for this amazing film piece!!!! This entry was posted on January 19, 2015 by bourgeoismagazinela in Bourgeois Magazine LA, Entertainment, Events, Film.